In Ax 2012 only supports Native Mode, while AX 2012 R2 supports Integrated and SharePoint Integrated Mode. 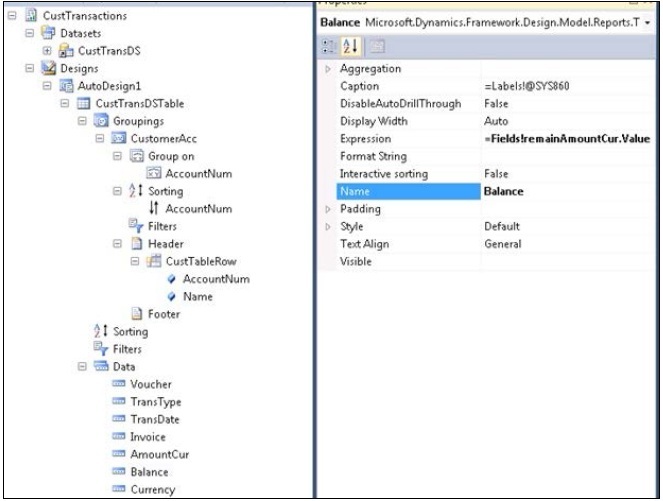 Model project in Visual Studio which hosts multiple SSRS reports. 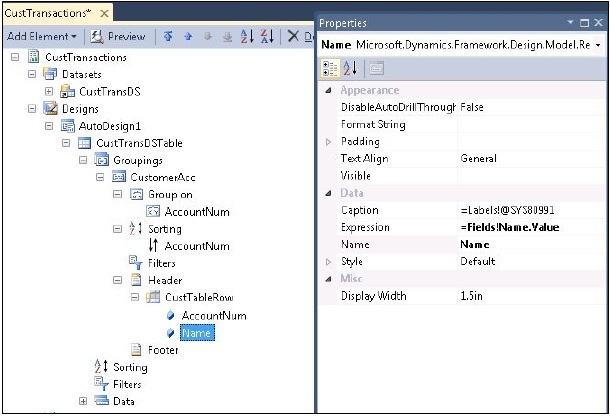 Let’s begin our Simple SSRS Report Development. Here we are going to see all the customers and their respective transactions in a report to see how well the company is able to manage customers, and which customer is providing them better sales. 1. Open Microsoft Dynamics AX 2012 from the Start menu. 1. Press Ctrl + D to open AOT in Development Workspace. 2. Press Ctrl + Shift + P to open Projects in Development Workspace. 4. Press Ctrl + Shift + W to open New Development Workspace. 3. Go to AOT | Queries node. 4. Right-click on the Queries node and click on New Query. 5. Right-click on the newly created query and navigate to Properties. Provide Title as Customer transactions. Provide Descriptions as All Customer transactions. 7. Under CusTransReport, right-click on Data Sources, and select New Data Source. 8. Set the Table property for the new data source to CustTable. 9. Select the Fields node and set Dynamic Property to Yes. 1. Start Visual Studio; press Ctrl + N to create a new project. 3. Provide a name for the project as CustTransReport. 1. Right-click on Solution; navigate to Report under Add submenu. 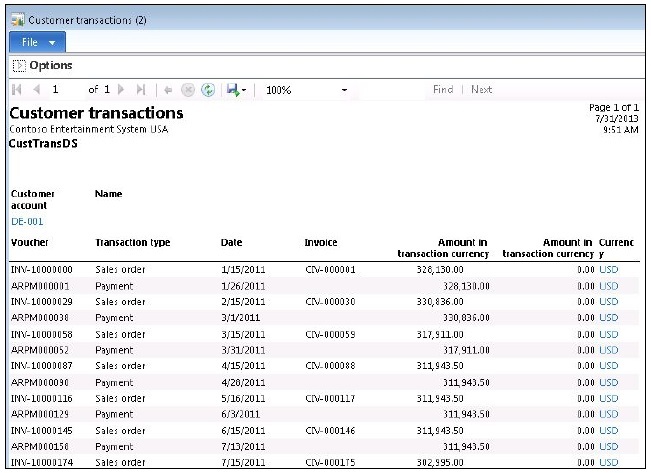 Select the report and rename it to CustTransactions. 2. Right-click on Datasets and click on Add dataset. 1. Data Source to Microsoft Dynamics AX. 2. Data Source Type to Query. 3. Default Layout to Table. 4. Switch to the Query property, and press the button at the top right-hand corner to open the Query dialog. 5. Select CustTransReport from the list and press the Next button. 6. Select the AccountNum, Name fields from CustTable_1, and select Voucher, TransType, TransDate, Invoice, AmountCur, remainAmountCur() display methods, and Currency fields from CustTrans_1. 7. Drag-and-drop CustTransDS to the Design section of the report. This will create a new Auto Design named as AutoDesign1. 2. Title to Customer transactions. 2. Title to List of customer transactions. 10. Right-click on Groupings inside CustTransDSTable and select Add Grouping. 11. Rename the new grouping to CustomerAcc. 14. Right-click on Sorting under CustomerAcc grouping and select Add Sort. 16. Right-click on Header under CustomerAcc grouping and select Add row. 17. Rename the row to CustTableRow. 18. Right-click on CustTableRow and select Add | Field. 20. Right-click on CustTableRow and select Add | Field. 21. Rename the field to Name and set Expression to Fields!Name.Value. fields (Refer to the following screenshot) were correctly added automatically. 23. Save all changes done. 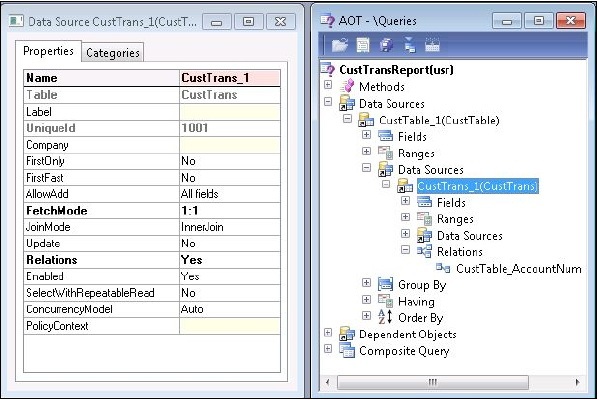 project and select Add CustTransReport to AOT. 1. 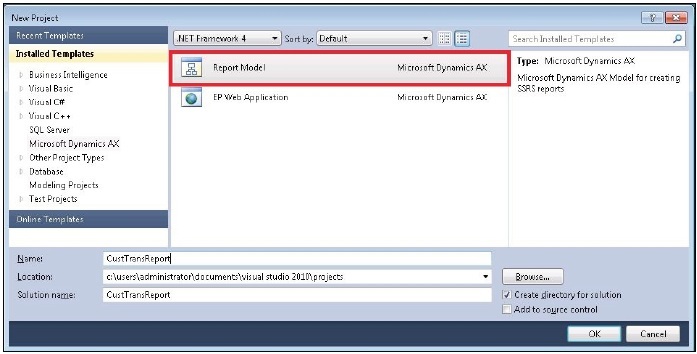 Right-click on the Report Model project and select Deploy. 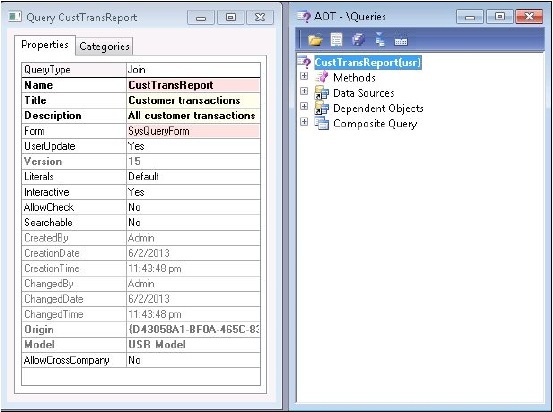 AOT | SSRS Reports | Deploy Element. 3. 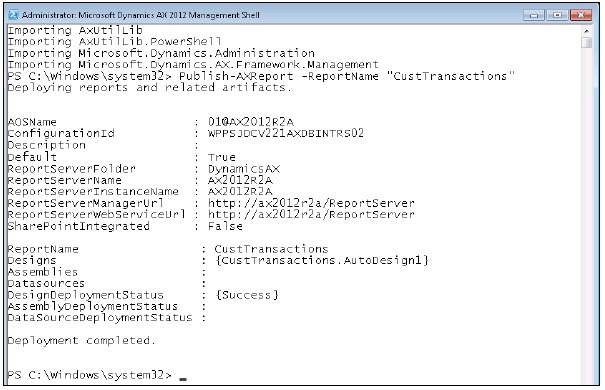 Deploy using Microsoft Dynamics AX 2012 Management Shell. 1. Click on Start | Administrative tools. 2. Right-click on Microsoft Dynamics AX 2012 Management Shell. 4. Enter the following PowerShell command to deploy. Output | New menu item. 2. Rename the menu item to CustTransactionsReport. 1. Label to Customer transactions. 2. HelpText to List of customer transactions. 5. Right-click on the CustTransactionsReport menu item and select Open. 6. 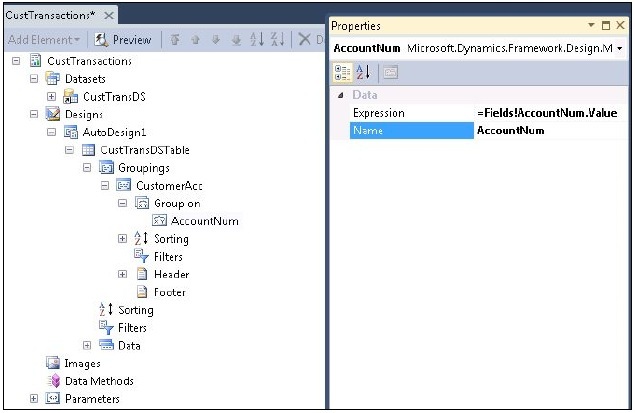 Provide some dynamics filters if required. 7. Click Ok to run the report.